We are one of the well-known service providers of Chiller room. 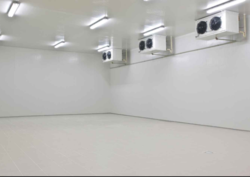 The offered chiller room is widely used for storing and preserving food materials such as raw meat, paneer and cheese. Our rendered chiller room is very useful for hotels, restaurants and fast food eating joints. The offered service for chiller room is very easily available at very affordable and cost effective market rates.